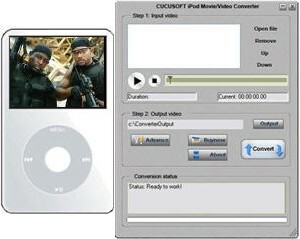 iPod Movie/Video Converter is an easy in usage video converter designed for Apple iPod Movie and iPod Video. This application is able to convert various video formats including XviD, DivX, MOV, rmvb, rm, dvr-ms, AVI, WMV, and MPEG, to iPod Movie format. The output iPod movie/video supports iPod screen.